As profound as it may sound, George Bernard Shaw shares his inimitable wisdom through his take on mistakes and the key to becoming successful. On our search for success in life, whether in our professional or personal realms, we face hindrances more times than we would like, and are often plagued by the consequences of these mistakes. The same holds true for the ones involved in freelance writing too, and it is best to have a thorough knowledge of what lies ahead in the path to success in having the freelance writing career that many of you may dream of having. Attracting many dynamic minds having a penchant for writing, freelancing is a relatively new genre in the job sphere of the current era. Keeping pace with the rapidly evolving digital age, freelancers can find lucrative job opportunities through the Internet nowadays. 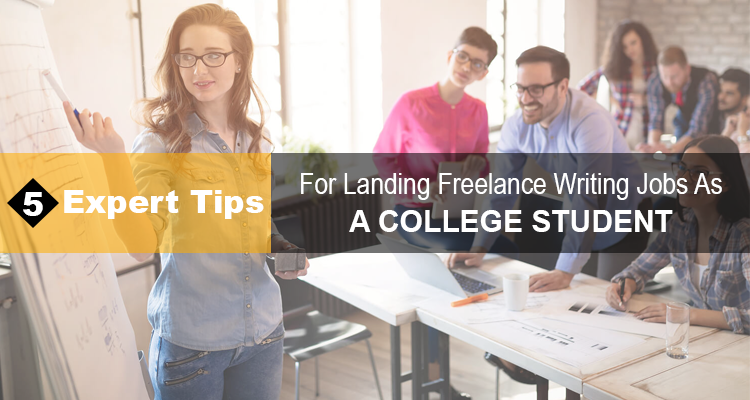 There is no dearth of various freelancing opportunities such as online academic writing jobs that help budding writers hone their skills and earn some extra money on the side. While these jobs are the ideal stepping-stones towards having a digitised and relevant career graph in the future, it is best to prepare for the times that lay ahead by knowing about some of the most typical mistakes that every newbie trying to make a place in the freelance writing realm is prone to commit. We have compiled for you an extensive list of the ten commonest errors in freelance writing that you will do better to avoid so that your writing career can shine twice more brightly than you imagine. Here are the top ten mistakes that freelance writers will do best to avoid for having a successful career in writing in the days to come. First things first – let us focus on your pitch. You see a great advertisement online that is looking for freelance writers, immediately notice that you fit the requirements to the T, and decide to apply straight away. But you know what? So do hundreds and thousands of applicants who have also spotted the advertisement and are gearing up to apply or have already applied. The one element that will make you stand apart from those hundreds and thousands of applicants – who are your competitors by the way – is your pitch. Do not make the rookie mistake of not having a superb pitch that is sure to impress the clients to no end, for that is the most powerful tool that you have to help you market yourself. Composing a winning pitch or cover letter for your job applications should come as second nature to you since you are a freelance writer looking to scale up his or her career. Established freelance writers are of the opinion that personalising your cover letters or pitches to incorporate some of the jargons and technical terms about the probable client’s area of expertise will help take your application a long way among employers. Briefing is the phase when your clients lay bare their requirements from you. The topic, word count, and your pay are all decided and discussed during the briefing session. However, many freelance writers make the mistake of not being clear about the discussions during the briefing. Either they do not listen properly or they fail to ask the questions that matter, but a lack of communication becomes apparent when the work that they submit is not quite up to the standards that the clients were expecting. This may lead to several complications, especially if you are a freelance writer who has started out his or her career. Keep a note of all the requirements and the specifications that your client states and prod them with more questions, so you have a clear understanding of what they want. Have a precise idea about the desired word count and approach, learn a bit about the target audience, and always ask along which lines you can strategically place your Call to Action (CTA) within your work. In the world that is ruled by content marketing over the Internet, the value for original content might draw parallels with the highest-priced shares in the international stock markets. Plagiarism is perhaps a sin of the highest order that one can commit in the realm of freelance writing and as tempting as it may seem, do not lift off engaging titles or opening lines from the Internet. Trust me on this, your clients WILL know if you apply unfair means to get the job done and you will be losing your integrity as well. Research all over the Internet and also among offline resources that you can lay your hands on, but come up with content that none other than YOU has created from scratch. As a freelance writer, try not to become a deft Ctrl+C & Ctrl+V person for you will have a hard time finding clients who are willing to pay for unoriginal content. To be on the safer side with your content, always run them through plagiarism scanners online to make your copy rid of words, phrases or sentences those are similar to already existing content on the Web or elsewhere. By-lines are what freelance writers thrive on (besides the money and flexible work timings, that is). You write a piece, it gets featured on a website or online magazine, your name finds a place below the piece with a brief description of who you are and what you do. That is basically all that a by-line is. So why such hullabaloo about it? It is because in this age of ghost writing, getting a piece with a by-line is like being on a quest for the Holy Grail. Many a tempest later, when you finally find a client who is willing to feature your name along with your work, be careful of what the by-line implies. Many freelance writers fall prey to the lure of Web fame that a by-line might bring along, and associates their names with products or services that would have been best left untouched. One of the many questions that you should ideally be asking during the briefing session, ask the editor or your client about the scope of having a by-line for the piece that they require from you. Carefully consider their answer before committing to them for it is best to take on the projects that will enhance your portfolio when it comes to by-lines and turn down the rest unless they are willing to pay you a fortune. Strike a right balance between money and recognition, and you will know which to choose when. As far as magazines and other publications are concerned, you must know that you have to work at a rate that is determined by the industry trends. However, such is not the case for the corporate clientele, and you must learn to understand the thin line of undervaluing and overpricing to tackle this one. You must first know that your work and effort is not worth peanuts, and from there fix rates that you and your client can work around to suit both of your ends. Talking money with clients may not be every freelance writer’s cup of tea, but stepping up to the occasion is what the day demands when it comes to competing in a market that is filled with talented writers vying for their time under the spotlight. Ask around to have an idea about the ongoing market rates before quoting your price to the client. In case you find the task too laborious or too much research-oriented, then prepare an updated invoice for them that include the additional hours that you put in for the projects to meet all their requirements. On this note, learn to be firm and stick your ground when it comes to negotiating about money with your clients for no one takes a professional seriously unless they have firm convictions about their market worth. Deadlines are dreadful indeed, but as a freelance writer, you should ideally be swearing by them for as long as you want a successful career in this industry. Messing around with deadlines is not something that you would like to do, for it brings along a series of negative implications that have the power to collapse your career to ruins. In the age of advanced telecommunications technology, if word gets out that you are a freelance writer who tends to get lazy or falls behind on deadlines, work will gradually stop coming your way. It is thus best to stick to the deadlines and take them very seriously. During the briefing session, have an in-depth discussion with your client about fixing the probable deadline for the project. If you feel that the project will require extensive research and detailed analysis, then ask for a few extra days to fit in those additional tasks in the process towards the completion. In case you find that you will still be unable to finish the project within the stipulated deadline, then you must notify the client at least a few days in advance so they have time to prepare for the delay at their end and your work ethics remain untarnished. We all know what happens when the doors of communication remain shut: the relationship starts to wither away with time. You do not want that to happen with your clients if you are keen on having a successful career as a freelance writer. A lot of newbies in freelancing feel that communication extends until the briefing session and that is about all the communication that they need to establish with their clients before the project is finished. Crucial to maintaining a well-established chain of communication between you and your clients is following up on the projects. Many freelance writers find following up and communicating as unnecessary prodding. What they do not realise is that in an increasingly competitive market, staying on top of your clients’ minds should be your top priority, and keeping the flame of communication alive is one of the ways to do it. Once you sign on a project, establish an email thread or chat thread that lets them keep a track on the progress of the project. Let them know how it is turning out in intermittent gaps, and if needed, ask for their insights on the project as they gradually warm up to you. Use your people skills to woo them over and show how much you are beyond your professional sphere. Establishing a chain of communication with your clients is thus not something that you can afford to overlook. Overpromising or signing up for more than you can deliver is a mistake that is best avoided if you want to lead a stress-free and prosperous life. Taking on too many projects at the same time has many negative impacts on your work and personal life. Firstly, your productivity is something that will go spiralling downward if you bite more than you can chew. Secondly, you will have very little time for rest, and since writing involves putting your creative genes to work, the fatigue will creep into your work as well. As someone who is new into the freelance writing realm, signing up for every other project might feel tempting due to the extra cash that comes your way, but you will have to compromise on the quality of your work and personal health in order to manage too many tasks at the same time. Learn how to say no and say it often. As a freelance writer, it might seem lucrative to have several projects running at the same time, but it is not a wise idea if you wish to grow in your career. Turn down all the projects that do not fall under your area of interest, and you will have to dig up a lot to piece together an article or two on. Turn down all projects that you do not conform with ethically. Turn down all projects that come in the guise of "doing a favour" for a friend or family member for freebies are not the way to go if you wish to take your writing career to new heights. Quite possibly a mistake that many freelance writers, including established ones, are guilty of, not running multiple revisions before you turn in your copy is one of the worst things that you can do to your clients. Small errors annoy often, and letting them creep into your copy is a very unwise decision that can easily be done away with. Turning in a flawed copy filled with typographical or grammatical errors leaves a bad impression on your image as a freelance writer, for the clients expect nothing but the very best for the money that they pay. It is thus not the mark of a great freelance writer to leave room for errors in the copies that they submit to their clients. The Internet nowadays is flooded with free grammar and spelling checking software and applications that you can always rely on for a complete scan of all your documents. Always consult a free grammar and spelling tool to go over your copies after the final drafting phase so that they can highlight and correct the simple grammar and punctuation errors in your copy. As for factual errors, always cross-check, verify, and cite all the information used in your copy that you have sourced externally so that you end up with an informative copy having robust grammar and punctuation that is sure to impress your clients. Since freelance writers do not function on a 9-to-5 schedule, many of them meander into keeping erratic hours of work. However, that does not bode well for your career for the value of discipline is not something that is to be neglected. Striking the perfect work-life balance too becomes difficult if you keep maintaining irregular hours of work. Writing a few paragraphs in the afternoon or jotting down a few lines during supper and on-the-go may work for the few initial months when the work pressure is relatively easier, but it gets tougher as you take on more projects and gradually create your niche in the freelance writing realm. The best way to go about fixing the issue of having a well worked-out schedule is creating one right away. If you are a morning person, schedule all your writing jobs in the morning when your productivity is at the peak. Similarly, assign the writing tasks at the dead of the night if burning the midnight candle works better for you. Always leave room for sleep and meals in between your work schedule along with regular breaks when you pause and stare away from the screen. Do not forget to keep time aside for some exercise and dabbling in what you love to do in your pastime so that the schedule has somewhat of a balance between work and play. Starting out in your freelancing career as a writer, you will be prone to many more mistakes. But now that you know the commonest ones and the ways that you can avoid them, steer clear of the same and create a carefully planned roadmap to take your career to the next level. Wishing you great luck in all your future endeavours! Are you on a quest for a fulfilling career in writing with a superb pay package? Come on board with NerdyTurtlez.com today to live the writing career of your dreams! If you are looking for ways to master the art of freelancing, look no further than Nerdy Turtlez. We can make your writing dream a reality with a wide range of intriguing tasks and a lucrative pay package that will take your freelance writing career many miles ahead. Prove your mettle at the Nerd Test and get numerous academic writing assignments from international clients from all over the world. Pick assignments that interest you and be your own boss at NerdyTurtlez.com. Offering the best remuneration for dynamic and talented freelance writers, NerdyTurtlez.com operates in the widespread network in countries such as: India, Kenya, Ukraine, Pakistan, Philippines, and Bangladesh along with the global clientele situated all around the world. Soar high in your freelance writing career with splendid remuneration and fascinating tasks at NerdyTurtlez.com. Join us today to write your way to success!